The best Carnival party is coming to Barcelona! Here at Cruïlla we are big fans of Carnival, a party that allows you to become someone else for a day, break the rules and let yourself go. And as fans, we wanted to join the party and celebrate one of the most enjoyable traditions of winter. That is why we want to announce the first edition of Carnaval del Cruïlla, that will take place on February 9th and 10th at the Hivernacle del Poble Espanyol in Barcelona. 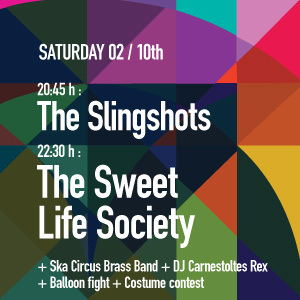 A party where you will take pleasure in all the rituals of Barcelona’s Carnival: the presence of King Carnestoltes, a charanga, a costume contest, masks, the Taronjada (balloon fight)… And, of course, the best live music! Shantel & Bucovina Club Orkestar, The Sweet Life Society, Los Mambo Jambo and The Slingshots will accompany us in this new adventure. Discover everything you will experience at Carnaval del Cruïlla 2018! 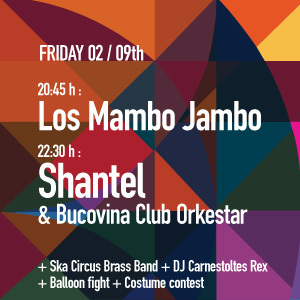 From 00:15h until 01:30h: DJ Carnestoltes Rex + speaker El Baró de la Boira + Taronjada (balloon fight) + costume contest. And if you want to live Carnaval del Cruïlla with full intensity, you can come both days for only 35€. Day tickets at the ticket office will cost 25€.